Napp-it and OmniOS is a storage platform that utilizes ZFS in its (near) native environment, an OpenSolaris OS. The fact that it uses a thoroughly enterprise file system and it is free means that it is extremely popular among IT professionals who are on constrained budgets. At STH we test hundreds of hardware combinations each year. From this experience, we are going to keep a running log of the best Napp-it and OmniOS hard drives. We are going to focus this guide on Napp-it and OmniOS servers with under 120 storage devices and will periodically update the listing. Like most ZFS systems, the real speed comes from caching. ZFS can take advantage of a fast write cache for the ZFS Intent Log or Separate ZFS Intent Log (SLOG). Here our are our top picks for napp-it and OmniOS ZIL/ SLOG drives. SAS option: HGST SLC or MLC 100GB, 200GB or 400GB drives ($75 to 300 on ebay). Non-STEC drives. The key here is that you want power loss protection, reliability, low latency, the ability to withstand a heavy write workload and ease of integration. While you may be tempted to get a NVMe m.2 SSD, the options with power loss protection are very hard to find as of this writing. You also do not need a huge SSD and can generally over provision a lower write endurance SSD significantly. 400GB is too large but some folks like having ample NAND on the devices. ZIL devices can sustain very heavy write workloads. Consumer SSDs and read-optimized data center SSDs will slow to a crawl on heavily used ZFS servers. With a PCIe interface and flash backed RAM, the DDRDrive X1 is still the best option despite its age. The DDRDrive X1 has limited driver support to Solaris derived OSes. With its custom driver, this is a low latency, high write endurance solution. The ZeusRAM 8TB uses DDR3 RAM and has a power loss protection circuit to keep data safe in the event of an emergency. The 8GB capacity is more than ample and these drives integrate very easily in systems since they are standard SAS drives. With that said, because the SAS interface of the ZeusRAM is still a limitation if you have a smaller SATA only system. After NVMe drives became popular, the ZeusRAM never had a follow-up product announced. The HGST message was clear, NVMe is the future. The ZeusRAM does have one major advantage, it can use commodity dual port SAS infrastructure to provide access to the device. 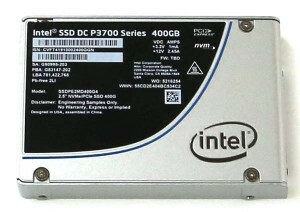 The Intel DC P3700 400GB drive can perform very well and can often be found at reasonably low prices. By utilizing PCIe and NVMe it is one of the better options on the market and receives high marks for write endurance, reliability and ease of integration. The Intel DC P3600 400GB is significantly slower than 800GB and larger models in the P3600 family but it con often be found at sub $1/ GB prices and is still an excellent drive. NVMe drives are nice because integration with OmniOS is extraordinarily simple (e.g. Plug-and-Play). Perhaps easier to use is the Intel DC S3700 series. Unlike the S3500 or S3610 drives, the S3700 100GB drive still performs well. The Intel S3700 drives are a gold standard in SSD reliability and they have firmware and write endurance optimized for heavy write workloads. Given used pricing, these are the drives to get if you are out of PCIe lanes. Likewise, the HGST 100, 200 and 400GB drives come in highly over-provisioned SLC and eMLC flavors. Look for models like the HUSSL4020ASS600 that are not STEC derived models. They used Intel NAND and controllers but were designed with HGST SAS2 / SAS3 interfaces and are built like tanks. If you go this route, skip the older HGST-STEC drives as those generally have lower performance. Beyond the above, there are many options available for ZIL devices. At this point, we suggest SSD only. Old articles may discuss 15K rpm disks but there is no point to be using that old architecture anymore. Ensure that you use reliable drives with power loss protection. There is no need to get a 800GB 7+ DWPD drive especially for smaller systems. We have seen these 800GB ZIL drives in 4x 6TB systems used to serve media files and that is ridiculous. There are many ZFS systems that will work well without a ZIL and it is easy to hear “you need write endurance and power loss protection” and overspend as a result.